Here's my second article in my "Exterior Door Installation" series. You can see my article just prior to this one on How To Stain And Finish A Wood Door for pictures and description of the work I did on the new, unfinished wood door for this project before preparing the doorway. Be sure and check out the last article in this series which covers installing a new pre-hung door. Before you begin removing an old door, you should have everything you need for the new door installation ready to go including tools and supplies. Be very sure your new door dimensions will work in the rough opening or be ready to make whatever adjustments are required for the new door. Manufactured doors come in standard widths of 30", 32" and 36". The standard height is 80" high and a 1-3/4" door thickness is typical. The jamb width is usually 4-9/16" or 5-9/16". Custom sizes are also available. The point here is to make sure you do not have to stop in the middle of a project to go get needed materials. It's often recommended that two people install a pre-hung door. Finding a helper isn't required though. Whether you do it alone or with help is up to you. You will however, need to be able to maneuver a bulky and heavy door into the opening, so you may want to consider finding at least a little help. I installed at least a few doors and never had help, so it can be done alone. The last important thing to consider before beginning is the door's sub sill. The door sill height is directly responsible for floor clearance when you open the door. You need to be sure your door will open and clear the floor, and not be too high. It also needs to be plumb in the opening. In this project, I purchased a pre-hung door which came with a door, hardware, door jamb and door sill plate. I replaced the sub sill as well, which I will go into detail in this article. For a description and list of door parts and their names, wikipedia has a decent illustration of a door jamb which includes the names of door parts. If you want to take a deeper dive into the various parts of a door and what they're called, you can check it out here. They don't show the sub sill, which is the very base of a door threshold. See the image at the top of this article for a closeup of the door sill plate and sub sill. You can see in the photo above how some of the exterior trim pieces were rotted at the bottom. Stain was used to kill the existing rot but eventually, everything has to be replaced. If the sub sill needs replacement, remove it as well. Take a picture if you want to make your new door installation even easier; Take pictures of both sides of the door after you remove the door and all the trim, but before you remove the jamb so you can see how the previous door was shimmed. Take an overall picture and a picture of each side. Don't rely on your memory to know where the shims were used or if the old door was exactly centered in the opening or not. You never know why the last door installation was done the way it was. Pictures can often solve new problems that come up with your new door. There is often no insulation filling the gaps between the veneer and the door frame (brick, in this case - see image below). If there isn't any, I like to add some. The reason I do is for energy efficiency around the door and to keep a few more critters away. It's just added energy efficiency in my book, and adds to the quietness of the door as well! A good hammer and medium sized crowbar are perfect tools for removing old trim and casings. Once the existing door is removed, the rough opening needs to be cleaned well. Clean up excessive caulking, and whatever shims and nails are protruding. A pro tip might be to use a reciprocating saw with a metal blade to cut through nails holding the old jamb, which can save several minutes of work, but unless you install doors regularly, it isn't necessary. The real key to a successful pre-hung door installation is the preparation of the bottom of the existing opening. If your rough opening sub-sill is bowed, crooked or bumpy, you'll need to straighten it up and get it as square as possible to plumb. That just means it needs to be nice and flat and level to the ground or structure it's going into and be very solid. If the integrity of the existing sub sill is at all in question, replace it. There are several methods used for truing up the bottom of the rough opening. If the existing base of the opening is concrete, you could add concrete to it to level it out, but it is likely that the overlay of concrete will crack and crumble underneath the sub sill. Mostly, I've been lucky enough to have only installed doors in nearly square doorways. 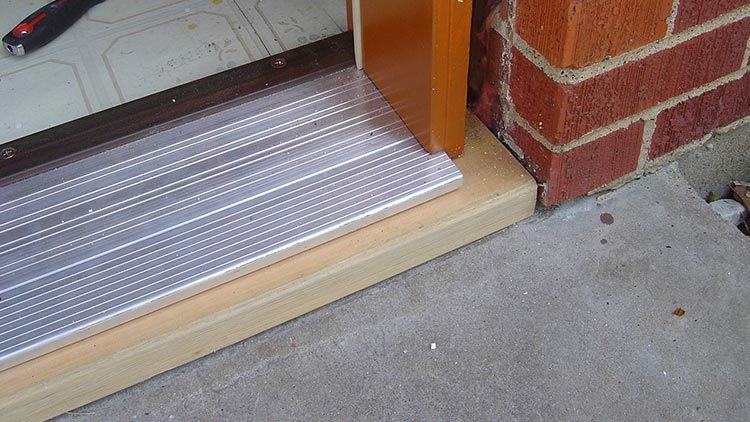 A good concrete leveler seems to be the right answer to a crooked sub sill, but it is impractical to use in a doorway since it needs to be poured. Perhaps some shoring may work with a good leveler. I don't really know, I haven't tried it. What I normally do, is simply replace a sub sill that's warped, cracked or not level. If it needs to be removed, it may as well be replaced. If your opening will require a new base to install your new door on, use the old sub-sill as a template. The new piece you put in should be treated lumber, but not pressure treated. Be sure and check local codes for standards and requirements in your area. Cut the new base until you have a match to the old one. The one I used was a standard 2"X10" treated board. Before gluing anything down, using a small level, set your new sub sill in place and run some shims under it until it's level, then remove the sub-sill, leaving the shims in place. Spread liquid nails generously (possibly over half a tube of the "general construction" glue - the light brown stuff) along the path of the threshold then re-install it over the leveling shims. Liquid Nails will take about 48 hours to dry completely. Once it dries, it is very hard, waterproof and holds everything together. Liquid Nails has become a staple in my door installation tool kit. At one property, I put in a threshold with a new sub-sill just like I did on this new door installation and had to remove it three years later after the owner decided to replace the entire door. I used Liquid Nails on that threshold too. It was a bit tough to remove, but not too bad, and I knew that it would have lasted many years. Once the base of the doorway is clean and level, you should double check all the way around the rough opening and make sure the exposed studs are clean and solid. Check everything with a square and level so you can get a good idea where your shims will need to go. You don't need to take a memory course or anything like that, but getting a strong sense of how the old door went in will help you out later on. Your surfaces should be clean and smooth with no nails sticking out anywhere. With the old door removal complete, the base of the threshold in, and everything cleaned up, you should be ready to install your new door. I cover the final pre-hung door installation as well and offer some useful door installation tips in my article "How To Install A Pre-hung Door" if you want to check that out. That article covers the last part of this project and you can see the final results, too. This is not a particularly difficult job to complete, and some basic care to ensure everything is correct from the start will form the foundation of a superb new door installation project. Do you have some door installation questions? Maybe you'd like to share what things came up for you when you did a door installation? Comment below!